Whatever the case, the facts of the matter are these: I was not expecting the Red Sox to take three out of four from the New York Yankees, I was not expecting them to take four out of five from the defending World Series-champion Houston Astros, and I sure as hell was not expecting them to win every postseason road game they’ve played so far. The Boston Red Sox have won the American League pennant for the fourth time in the past 14 years, the 2018 World Series will commence at Fenway Park tonight, and I am excited about it in a way that would suggest to a normal person that I have more to do with the team’s accomplishments than simply performing a number of superstitious rituals while sitting on the couch drinking Sam Adams, screaming at the TV, and over-aggressively high-fiving my wife and kids every time something good happens. After watching the Sox get swept out of the 2016 ALDS and seeing them fall 1-3 in last year’s division series, I just wanted them to make it to the ALCS this year. I considered anything more than that a bonus. Why? Because I realize how spoiled we are. My son was born in 2003. 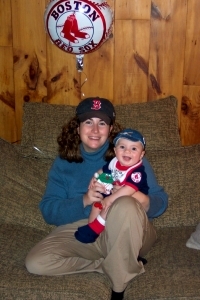 Here he is with my wife just before the first pitch was thrown in Game 7 of the 2003 ALCS at Yankee Stadium. Thankfully, he was too young to remember just how awful that night ended up being. 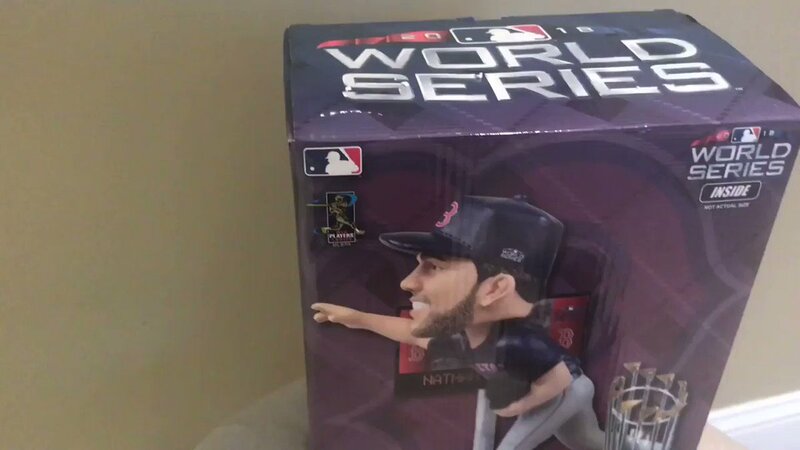 This year marks the 10th time since his birth that the Red Sox have played in the postseason, and the fourth time that they’ve made it to the World Series. The three previous times, they won it all. He thinks this is normal. 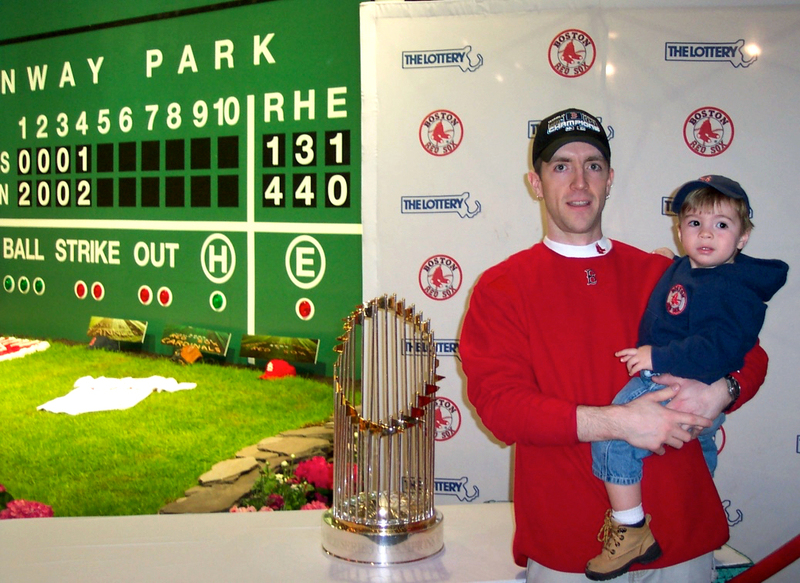 When you’re photographed next to the World Series trophy at age 1, and then you see them win it all at again at age four, and again at age 10, you become accustomed to a kind of Red Sox fandom that generations of those who came before you could never have imagined. 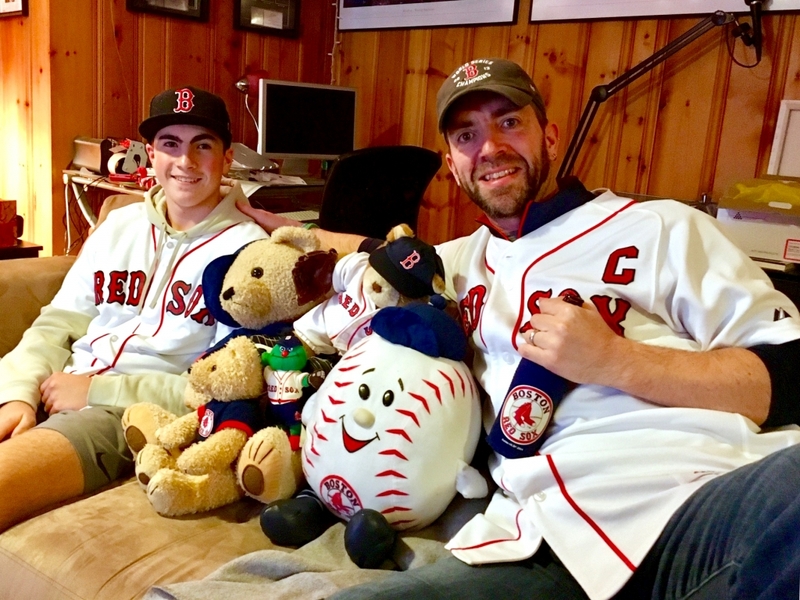 The Sox are in the postseason so regularly that we have developed traditions around it. 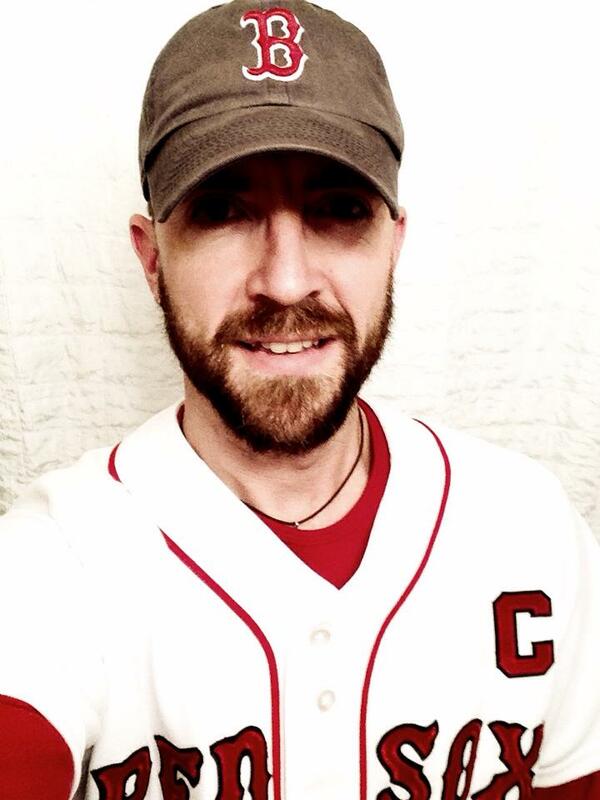 During each postseason game, we don our Red Sox jerseys. 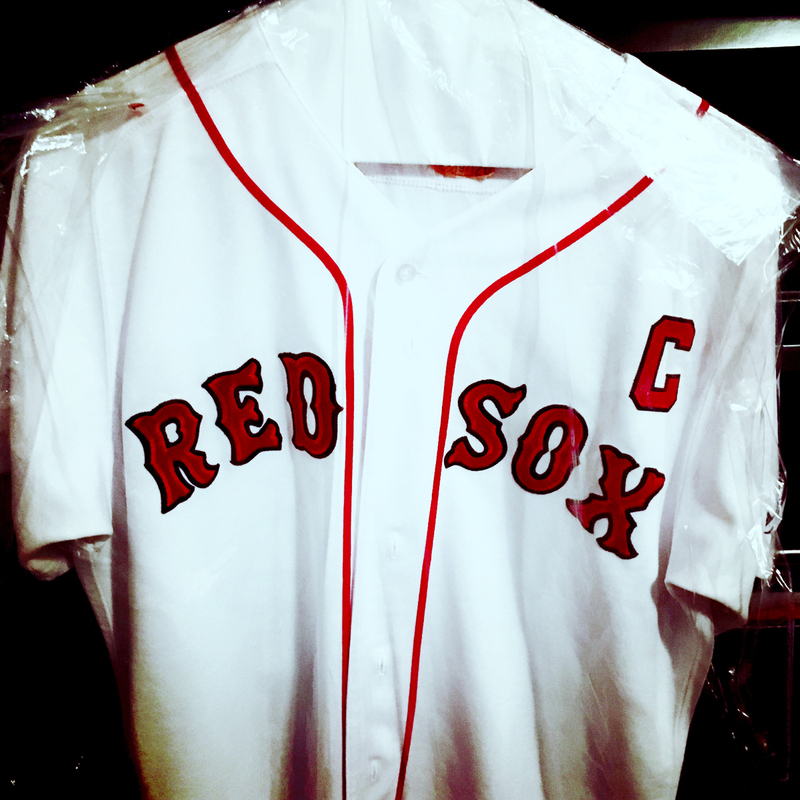 Mine is an authentic Jason Varitek home jersey — which, until Game 1 of this year’s ALDS, had remained shrouded in plastic on the hanger from the dry-cleaner where it was laundered immediately following last year’s postseason collapse. 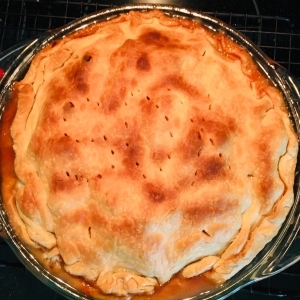 “Mom,” he said, “if the Red Sox make it to the World Series, you need to make apple pie topped with apple crisp.” It seemed, at the time, like a long-shot proposal made mostly in jest. She cooked the crisp yesterday; she texted us this picture after removing the pie from the oven earlier today. Look closely; those little ventilation holes aren’t positioned randomly. 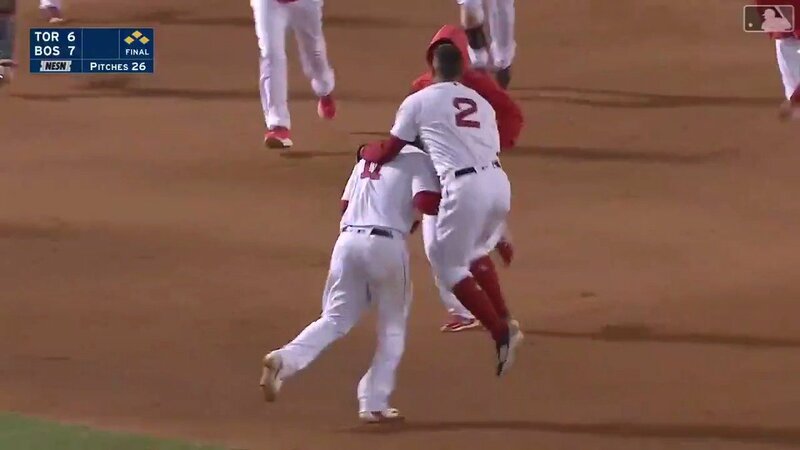 When the Red Sox are playing in the postseason, every day feels like Christmas Eve, and I am like a 5-year-old who can’t get to sleep. And when they win it all, it feels like Christmas Day times 10. Of the 30 teams that make up Major League Baseball, seven haven’t played in a World Series for at least a decade, five haven’t been there for at least two decades, and three haven’t claimed a pennant in more than three decades. Milwaukee Brewers fans just watched their team make it to a Game 7 that, had they won, would have sent them to the World Series for the first time in 36 years. For the Pittsburgh Pirates, it’s been almost 40 years. The Seattle Mariners and Washington Nationals (formerly the Montreal Expos)? Neither has ever played in a World Series. That’s 42 years for the Mariners and 50 years for the Nationals/Expos. 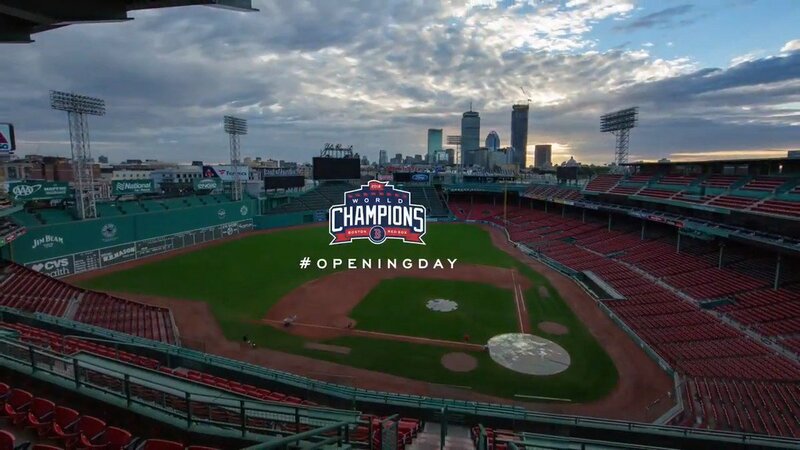 Each time that the Red Sox play in the World Series, I am acutely aware that it will likely be years before I get to see them do it again, if ever. It is hard to imagine this Red Sox franchise slipping into a decades-long pennant drought … but the numbers above prove that it’s entirely possible. 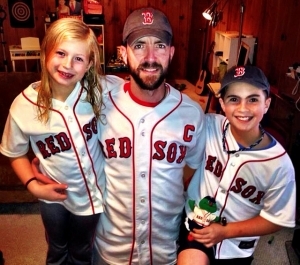 So tonight, I will don my Varitek jersey, sit beside a gaggle of stuffed Red Sox critters, high-five my family till our hands sting, and gorge myself on Sam Adams and homemade apple pie topped with homemade apple crisp like it’s the last time I’ll ever get the chance to do so … and it will be goddamn glorious.